Using their ‘ergonomic sports system’ principles, Falke have created these Falke GO2 Medium Volume Golf Trainer Socks to behave like a cushioned, supportive second skin for closer, more direct shoe contact and comfort during a long weekend’s golfing. With their patented anatomical toe box for a perfect fit, a shaped arch and anatomically targeted cushioning with air circulation ribs, they maximise comfort and protection. 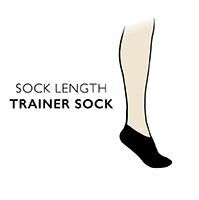 Falke GO2 Medium Volume Golf Trainer Socks feature a supportive, elasticated instep band, which, with the shaped heel cup, also helps stop the socks slipping around. The comfort top cuff is easier to wear for long periods and has cushioning at the Achilles area.